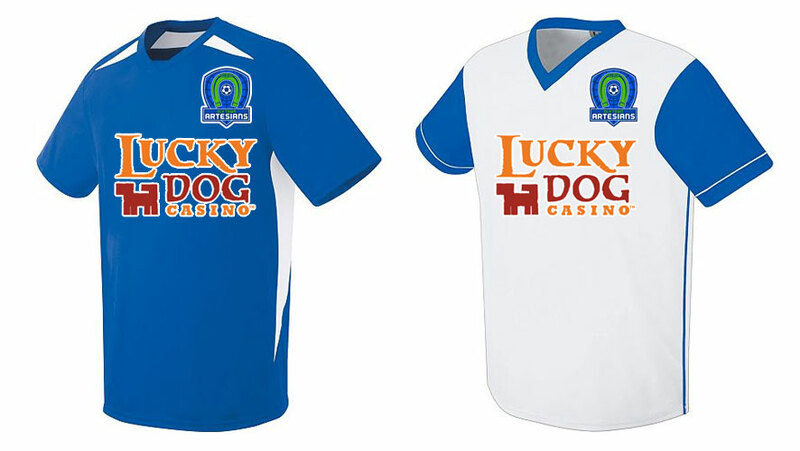 The Oly Town Artesians are pleased to announce that Lucky Dog Casino will be the official sponsor of the club’s inaugural season jerseys. The Lucky Dog Casino logo will grace the front of the Artesians home and away jerseys for the entire 2014-2015 season. The jerseys will make their debut today (Saturday, November 1st) at the Northwest Indoor Soccer Invitational at the Tacoma Soccer Center. The Artesians will play three preseason games beginning with a 2:30 PM matchup with fellow Western Indoor Soccer League squad Arlington Aviators, a 3:30 game against South Sound United and wrapping up with the Snohomish Skyhawks at 5:30. Admission to the entire tournament is free and games begin at 2:00 PM. The Skokomish Nation’s Lucky Dog Casino is located just north of Shelton on US HWY 101. The casino will host a kick-off party for the Artesians and a mid-season event for the club at a time and date yet to be announced. A formal unveiling of the jerseys is planned for next week at an event in Olympia. More information on that event will be released shortly. Other sponsorship opportunities with the Artesians are available by calling Brandon Sparks at (360) 561-7252 or emailing olytownartesians@gmail.com.